At the WGNHS we strive to conduct science that is useful to the citizens of Wisconsin. We communicate the results of that science to local and state government, private citizens, and other interested parties, such as planning commissions and environmental consultants. My interests include hydrogeology, near-surface geophysics, and physical properties of geologic materials. 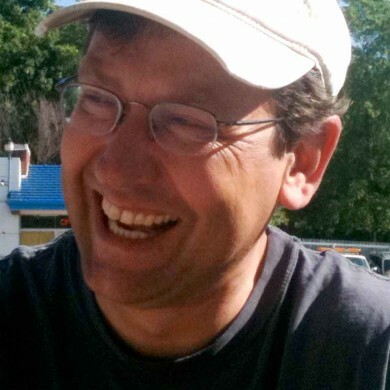 My areas of research include wellhead protection, water use, the application of near-surface geophysics to geologic and hydrogeologic problems, development of techniques to understand the role of aquitards in flow systems, measuring flows in boreholes, and incorporating geology into the design of geothermal heat pump systems. My interest in groundwater education has taken me into the classroom. I am an instructor for workshops for teachers who want to learn to use an interactive groundwater model to demonstrate concepts such as flow through various types of materials. I collaborate with faculty and students in the University of Wisconsin-Madison Department of Geology and Geophysics and Department of Civil and Environmental Engineering. I work with colleagues in the U.S. Geological Survey Wisconsin Water Science Center, Middleton, Wisconsin. 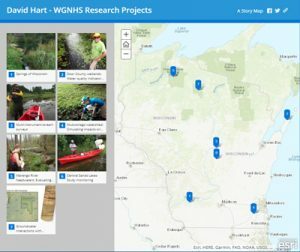 I work with colleagues throughout UW–Extension and the Wisconsin Department of Natural Resources, including faculty and staff at the Center for Watershed Science and Education. These are refereed technical publications in national or international scientific journals. McDaniel, A., Tinjum, J., Hart, D., Lin, Y., Stumpf, A., and Thomas, L., 2018, Distributed thermal response test to analyze thermal properties in heterogeneous lithology. Geothermics, v. 76, pp. 115-124, https://doi.org/10.1016/j.geothermics.2018.07.003. Sellwood, S.M., Bahr, J.M., and Hart, D.J., 2016, Evaluation of discrete-depth heat dissipation test for thermal characterization of the subsurface, in Dowling, C.B., Neumann, K., and Florea, L.J., eds., Geothermal Energy: An Important Resource: Geological Society of Americal Special Paper 519, doi: 10.1130/2016.2519(05). Walker, M.D., Meyer, L.L., Tinjum, J.M, and Hart, D.J., 2015, Thermal property measurements of stratigraphic units with modeled implications for expected performance of vertical ground source heat pumps: Geotechnical and Geological Engineering, v. 33, no. 2, p. 223–238, doi: 10.1007/s10706-015-9847-y. Sellwood, S.M., Hart, D.J., and Bahr, J.M., 2015, Evaluating the use of in-well heat tracer tests to measure borehole flow rates: Groundwater Monitoring and Remediation, v. 35, no. 4, pp. 85–94, doi: 10.1111/gwmr.12134. Sellwood, S.M., Hart, D.J., and Bahr, J.M., 2015, An in-well heat-tracer-test method for evaluating borehole flow conditions: Hydrogeology Journal, 23: 1817, doi: 10.1007/s10040-015-1304-8. Dunkle, K.M., Anderson, M.P., Hart, D.J., 2015, New ways of using well construction reports for hydrostratigraphic analyses: Groundwater, v. 54, no. 1, doi: 10.1111/gwat.12326. Hart, D.J., 2015, A comparison of fracture transmissivities in granite water wells before and after hydrofracturing. Hydrogeology Journal, 23: 21 doi: 10.1007/s10040-015-1315-5. Leaf, T. Andrew, D. J. Hart, J.M. Bahr (2011) Active Thermal Tracer Tests for Improved Hydrostratigraphic Characterization. Ground Water. v. 50, no. 5, p. 726-735. Hart, D.J. and H.F. Wang, (2010) Variation of Unjacketed Pore Compressibility Using Gassmann’s Equation and an Overdetermined Set of Volumetric Poroelastic Measurements. Geophysics, v. 75, no 1, p. N9-N18. Hart, D.J., Bradbury, K.R., and Gotkowitz, M.B. (2008) Is One an Upper Limit for Natural Hydraulic Gradients? Ground Water, v. 46, no 4, p. 518-520. Hart, D.J., Bradbury, K.R., and Feinstein, D.T. (2006) The vertical hydraulic conductivity of an aquitard at two spatial scales: Ground Water, v. 44, no 2, p. 201-211. Courtier, A.M., D.J. Hart, and N.I. Christensen (2004) Seismic Properties of Leg 195 Serpentinites and Their Geophysical Implications. Proceedings of the Ocean Drilling Program, Vol. 195, MS number: 195SR-104. Hart, D.J. and W.S. Hammond (2002) Measurement of hydraulic conductivity and specific storage using the shipboard Manheim squeezer. In: Proceedings of the Ocean Drilling Program, initial reports, seafloor observatories and the Kuroshio Current; covering Leg 195 of the cruises of the drilling vessel JOIDES Resolution; Apra Harbor, Guam, to Keelung, Taiwan; sites 1200-1202, 2 March-2 May 2001. Hart, D.J. and Wang, H.F. (2001) A single test method for determination of poroelastic constants and flow parameters in rocks with low hydraulic conductivities. International Journal of Rock Mechanics & Mining Sciences. 38: pp. 577-583. Hart, D.J. and Wang, H.F. (1995) Laboratory measurements of a complete set of poroelastic moduli for Berea sandstone and Indiana limestone. Journal of . Geophysical Research, 100: pp. 17,741-17,744. Wang, H.F. and Hart, D.J. (1993) Experimental Error for Permeability and Specific Storage from Pulse Decay Measurements, International Journal of Rock Mechanics and Mining Sciences & Geomechanics Abstracts. 30: 7, pp. 1173-1176. Short papers in national or international proceedings volumes, generally not peer reviewed. McDaniel, A. Harper, M., Fratta, D., Tinjum, J. Choi, C., and Hart, D. (2016) Dynamic Calibration of a Fiber-Optic Distributed Temperature Sensing Network at a District-Scale Geothermal Exchange Borefield. Geo-Chicago GSP 270. Schuettpelz, C. C., Hart, D. J., and Fratta, D. (2007). The Use Multiple Geophysical Techniques for the Evaluation of Location and Formation of Sinkholes in a Retention Pond. SAGEEP Conference. Denver, CO.
Hart, D.J. and C.T. Thomas (2004) Using time-domain electromagnetics to map the transition of an aquifer to an aquitard, In Timms et al. (eds), 18th Annual SAGEEP Proceedings-Geoophysical Solutions for Today’s Challenges, 780-789 X-CD Technologies, Atlanta. Feinstein, D., D. Saad, D. Hart, K. Zeiler (2003) Reconciling Recharge and Discharge in a Regional Flow Model. In Poeter et al. (eds) Proceedings of MODFLOW and MORE 2003: Understanding through Modeling. 351-355 IGWMC publications, Golder, Colorado. Hart, D.J. and H.F. Wang (1999) Pore pressure and confining stress dependence of poroelastic linear compressibilities and Skempton’s B coefficient for Berea sandstone. In Amadei et al. (eds), Proceedings of the 37th U.S. Rock Mechanics Symposium. 365-371, Rotterdam: Balkema. Hart, D.J. and H.F. Wang (1998) Poroelastic effects during a laboratory transient pore pressure test. In Thimus et al. (eds), Poromechanics, 579-582. Rotterdam: Balkema. Tokunaga, T. D.J. Hart, and H.F. Wang (1998) Complete set of anisotropic poroelastic moduli for Berea sandstone. In Thimus et al. (eds), Poromechanics, 629-634. Rotterdam: Balkema. Technical reports prepared in the fulfillment of grants or contracts. Greve, R.M., and Hart, D.J. (2018) Central Sands Lakes Study: Annotated Bibliography (WOFR 2018-04), Wisconsin Geological and Natural History Survey Open File Report, 1-44. Haas, L., Zambito, J., and Hart, D. (2017) Portable X-Ray Flourescense (pXRF) Measurements of Uranium and Thorium in Madison, Wisconsin, Water Utility Wells 4 and27 (WOFR 2017-01), Wisconsin Geological and Natural History Survey Open File Report, 1-10. Hart, D.J. (2017) Hydrogeology of Fort McCoy Geothermal Test Well 5: Wisconsin Geological and Natural History Survey Technical Report TR-3. P. 16. Choi, C.Y., Hart, D.J., Tinjum, J.M., and Harper, M.K. (2016) Assessment of Environmental Impacts of Geothermal Source Heat Exchange. Groundwater Research Report to the Wisconsin Water Resources Institute. Hart, D.J. (2013) Hydrogeology of Fort McCoy Geothermal Test Hole #5. Wisconsin Geological and Natural History Survey. Submitted to Fort McCoy. In preparation as a WGNHS Open File Report. Hart, D.J., P.R. Schoephoester, and KR. Bradbury (2012) Groundwater Recharge in Dane County, Wisconsin: Estimating recharge using a GIS-based water-balance model. Wisconsin Geological and Natural History Survey Bulletin 107. p. 11. Bahr, J.M., D.J. Hart, A.T. Leaf, (2011) Distributed temperature sensing (DTS) as a hydrostratigraphic characterization tool. Groundwater Research Report to the Wisconsin Department of Natural Resources. Hart, D.J., and Schoephoester, A. P. (2012). Groundwater recharge in Calumet, Outagamie, and Winnebago Counties, Wisconsin, estimated by a GIS-based water-balance model (WOFR2011-05). Wisconsin Geological and Natural History Survey Open File Report, 1–26. Luczaj, J.A. and D.J.Hart, (2009) Drawdown in the northeast groundwater management area (Brown, Outagamie, and Calumet Counties, Wisconsin. Groundwater Research Report to the Wisconsin Department of Natural Resources. Hooyer, T.S., D.J. Hart, K.R. Bradbury, D.M. Mickelson, and C.A. Moeller (2008) Investigating Groundwater recharge to the Cambrian-Ordovician Aquifer through fine-grained glacial deposits in the Fox River Valley. Groundwater Research Report to the Wisconsin Department of Natural Resources. Hart, D.J., P. Schoephoester, and K.R. Bradbury (2009) Groundwater Recharge in Dane County, Wisconsin, Estimated by a GIS-Based Water-Balance Model, Submitted to Dane County Department of Land and Water Resources: Wisconsin Geological and Natural History Survey Open-File Report 2009-01 16 p.
Swanson, S.K., Bradbury, K.R., and Hart, D.J. Assessing the Ecological Status and Vulnerability of Springs in Wisconsin: Wisconsin Geological and Natural History Survey Open-File Report 2008, 91 p.
Southeastern Wisconsin Regional Planning Commission/Wisconsin Geological and Natural History Survey, (2008), Groundwater recharge in southeastern Wisconsin estimated by a GIS-based water-balance model: Southeastern Wisconsin Regional Planning Commission Technical Report No. 47, 23 p.
Bradbury, K.R., M.B. Gotkowitz, D.J. Hart, T.T. Eaton, J.A. Cherry, B.L. Parker, and M.A. Borchardt (2007), – Part B: Technical Guidance for Assessing Contaminant Transport Through Aquitards. Awwa Reseach Foundation, Denver Co. 143 p.
Cherry, J.A., B.L. Parker, K.R. Bradbury, T.T. Eaton, M.B. Gotkowitz, D.J. Hart, and M.A. Borchardt (2007), Assessment of Contaminant Transport Through Aquitards – Part A: A “State of the Science” Report. 146 p.
Fratta, D. and D. Hart (2005), Geophysical Study for the Evaluation of Sinkholes at the Blackhawk Park Retention Pond. Interim Report and Engineering Recommendations. Submitted to the City of Madison. 34 p.
Feinstein, D.T., T.T. Eaton, D.J. Hart, J.T. Krohelski, and K.R. Bradbury (2004) Simulation of regional groundwater flow in southeastern Wisconsin: Wisconsin Geological and Natural History Survey Open-File Report 2004-01, 134 p.
Hart, D.J., M.L. Anderson, and D.A. Alumbaugh (2003) Determination of Aquitard and Crystalline Bedrock Depth Using Time Domain Electromagnetics. Groundwater Research Report WRI GRR 03-06.Madison, WI 15 p.